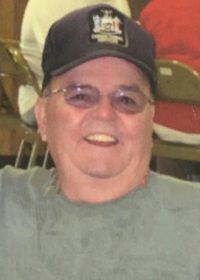 William G. “Bill” Robinson – (83) – of 1 Clubview Dr., Bath, formerly of Hornell, died early Wednesday morning (May 30, 2018) at his home, following a long illness. Born in Hornell on March 28, 1935, he was the son of Gordon & Evelyn (Austin) Robinson. Bill grew up in Hornell and attended Hornell High School. He was a veteran of the US Army, serving his country from 1955 – 1957 as a member of the Ninety Millimeter Gun Battery Unit. He was employed for about 6 years in the paper coating department of Eastman Kodak Corporation and later worked construction for several construction companies. For several years Bill served as an inspector for Steuben Rural Electric Company and also Bath Electric, Gas & Water. He worked as a corrections officer at Sing-Sing prison near New York City and for about 6 years at the Livingston County Corrections Facility, retiring in 1997. Bill was a member of the Bath United Methodist Church and had been a member of the Bath American Legion and the Bath Elks Lodge. He was an avid Buffalo Bills fan and loved playing golf at the Bath Country Club and the Hornell Golf Club. In addition to his parents, he was preceded in death by his sister, Bonnie Headly. He was married on February 9, 2003 to the former Robin Bailey McDaniels who surviving. Surviving are his children, Teri, Kelly & Bill; 2 sisters, Linda (John) Giglio and Sally Wistman; 4 step-children; 10 step-grandchildren; several nieces & nephews. At Bill’s request there will be no calling hours or services. Funeral arrangements are in care of the Dagon Funeral Home, 38 Church St., Hornell, NY. Bill’s family request that in lieu of flowers, memorial contributions in his name be made to a charity of the donor’s choice..